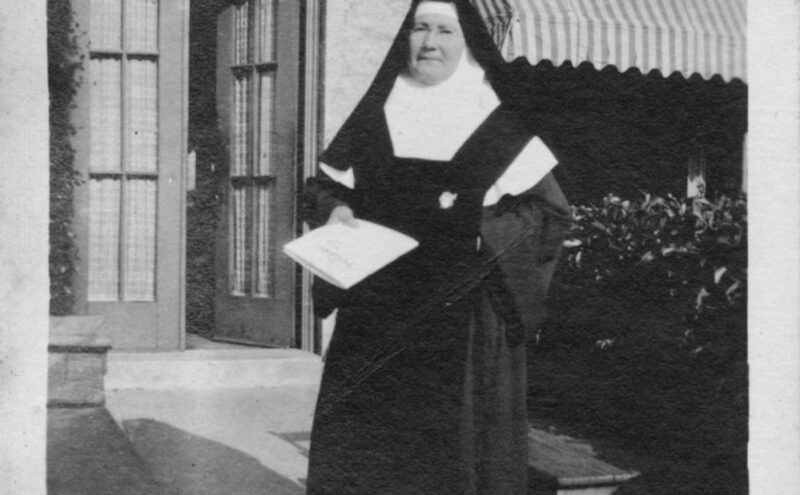 I’ve tried to determine the identity of the inaugural head of the independent Sisters of the Immaculate Heart of Mary, Mother General Mary Genevieve Parker, for several years. She appears in a photograph album assembled by my great grandparents on a trip they took to California from Wisconsin in the 1920s. Genevieve Parker’s death certificate listed her parents as James Parker and Ellen Nagel, my great grandmother’s uncle and aunt. 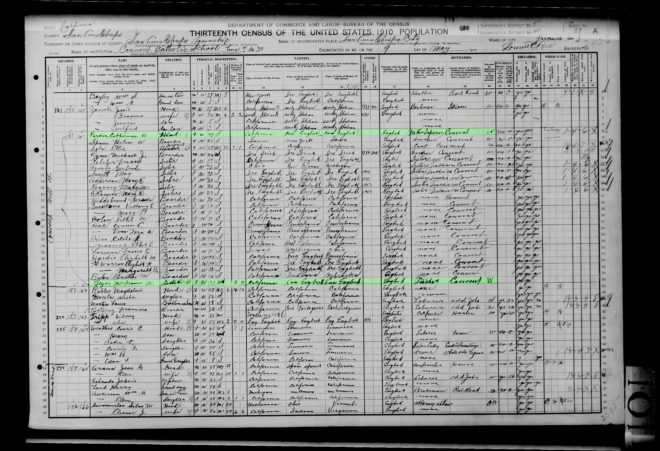 However, census records for James and Ellen Parker’s family from 1860 to 1880 do not list a Mary Genevieve Parker. The daughters in those censuses are Catherine, Mary, Ella, Frances and Theresa. Mary became Mrs. Thomas H. Lyons and died in 1915. Ella became Mrs. John H. Murphy and died in 1959. Theresa became Mrs. Frederick Donnelly and died in 1899. Frances became Mrs. Max von Beyer, but the last record I’d found for her until recently was in a Los Angeles city directory in 1909. It was possible she joined a convent and advanced rapidly. So while I suspected Mary Genevieve Parker was Catherine Parker, I couldn’t rule out Frances Parker. However, two records recently came to light which helped me figure this out. One of them I’d had in my possession all along. The first key was that FamilySearch recently added Los Angeles area death certificates to their “California, County Birth and Death Records” collection, and the index includes parents names. So a search for Ellen Nagel had Frances’ death certificate in the search results. She died in 1915 as Frances Parker Hilton, wife of Lewis Lorenzo Hilton. That allowed me to exclude her from consideration as Genevieve Parker, and also lead to me finding a whole host of other records about her: her 1900 US Census record (as Fannie Beyer), Max von Beyer’s death certificate from 1906, her marriage certificate to Lewis Lorenzo Hilton, and crucially her 1910 US census record. 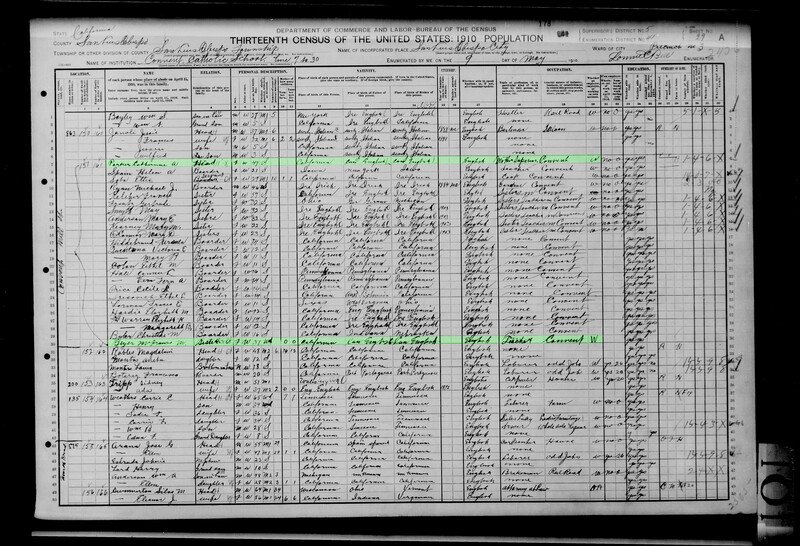 The 1910 US census record was what put the final nail in the identity of Genevieve Parker as Catherine Parker. 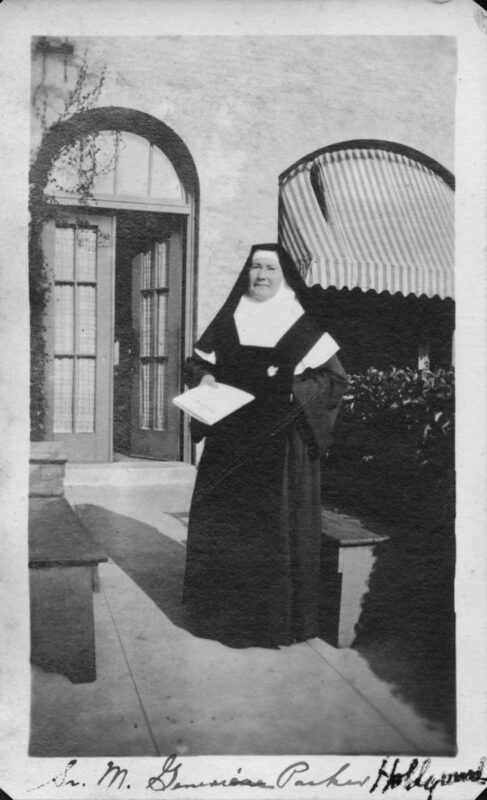 In 1910, Frances Beyer was enumerated as a teacher at a convent in San Luis Obispo. Several dozen names above hers as the head of the convent was listed Catherine Parker. I’ve had that record for years! assuming it was Genevieve Parker but without any evidence except a hunch. But somehow I’d never read down the complete list of names to see Frances Beyer near the bottom of the page. Her relationship to Genevieve Parker in that column? “Sister”. If only I’d read the entire page much earlier. In any case, it’s found now and I’ve identified all five daughters of James Parker and Ellen Nagle. Still left on my plate are what happened to 2 of the 4 sons and Ellen herself.